I have been a long time lover of innocent smoothies. I remember the first time I bought one, looking at the quirky comments on their packaging and the attention to detail and being wowed that a company was daring to be so ‘fun’. Back then it was quite forward thinking that a brand could be friendly and lighthearted and I loved their approach (and their drinks, which helped). 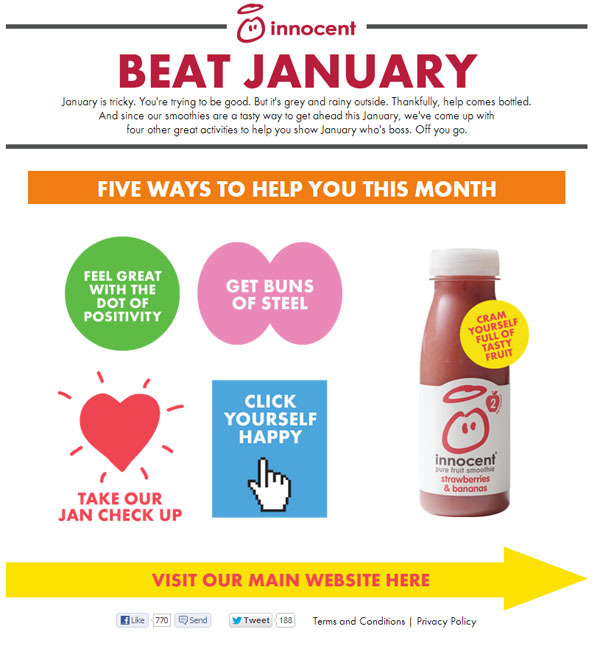 So I was chuffed when Innocent recently contacted me to let me know about their efforts to help people make a healthy start to 2013 and to offer to give away two months’ worth of smoothies to one lucky A Rosie Outlook reader. Innocent have launched four ways to look after your mind, body and soul in the New Year. From their Buns of Steel workout to the dot of positivity, you can beat January just by heading over to the innocent site. It will definitely, definitely make you feel better. If you want to feel better inside as well as out then you can enter my innocent smoothies giveaway to win a two months’ supply of innocent (they will send you vouchers, don’t worry, you don’t have to throw out the contents of your fridge). You can enter via the Rafflecopter below. The giveaway will end at midnight on the 16 January and the winner will be chosen at random and notified by the end of the week. Innocent will then post out the vouchers for the smooooothies – yum!